Forget the marshmallows- these sweet potatoes are sweet, tasty, aromatic and straight-up comfort food, sans grease! These baked sweet potato fries are naturally sweet and flavored with cinnamon to enhance the taste of this fall favorite! Sweet potatoes offer a ton of beta-carotene, a precursor form of vitamin A, along with fiber and a creamy taste, while being naturally low in fat! Instead of baked yams with butter and marshmallows, relish the real flavor of these potatoes without all of the extra calories! 2. Wash sweet potatoes well. Dry with paper towel (the skin is included in this recipe). 3. Slice sweet potatoes in half. Cut each half into strips (approximately 1/2 in thick, or to desired thickness). 4. Spray baking sheet or casserole dish with cookin spray. 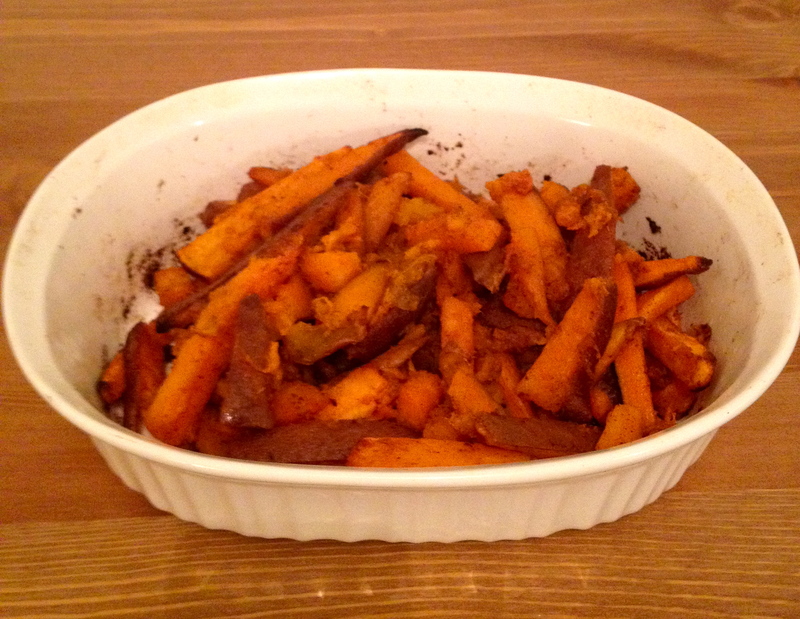 Place sweet potato strips on baking sheet/in casserole dish. 5. Drizzle oil over sliced sweet potatoes. Add salt, pepper and cinnamon. Mix well and arrange in thin, single layer. 6. Bake for 45 minutes- 1 hour (depending on desired crunchiness), mixing every 15 minutes. Fries should be soft and slighty crunchy. Serve hot. Calories 151 calories, Fat 11 g, Saturated Fat 1 g, Cholesterol 0 mg, Sodium 60 mg, Carbohydrates 12 g, Fiber 2 g, Sugar 5 g, Protein 1 g, Calcium 29 mg.
A friend of mine gave me this recipe – and I am so glad that she did! 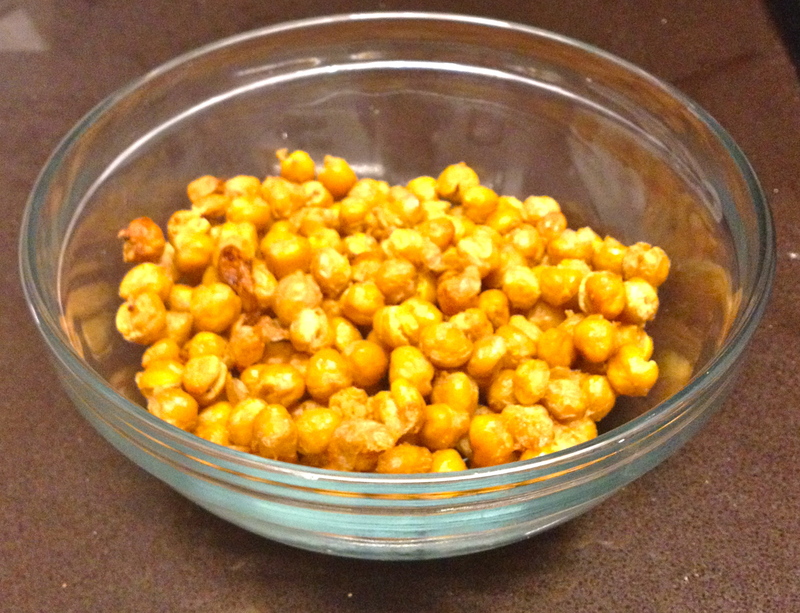 These chickpeas are warm, have a slight crunch and are completely addicting! A great substitute for chips, french fries or buttery popcorn, this snack offers healthy unsaturated fat, fiber, protein and a ton of minerals, all for under 150 calories per serving! Best of all? You will start craving these instead of fried foods – they are just as good, if not better! 2. 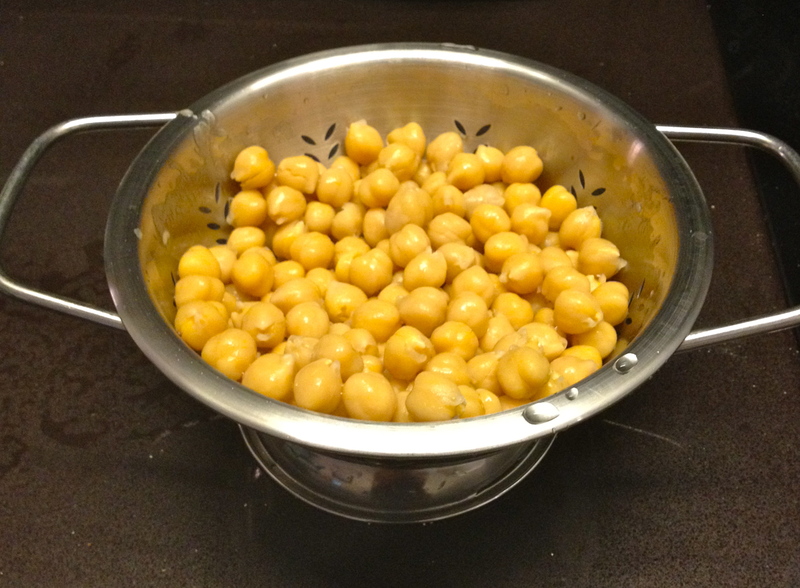 Open can of chickpeas and place in colander . Rinse and drain. Pat dry with paper towel. 3. Transfer chickpeas to medium bowl. Add olive oil and spices. Mix well with spoon. 4. 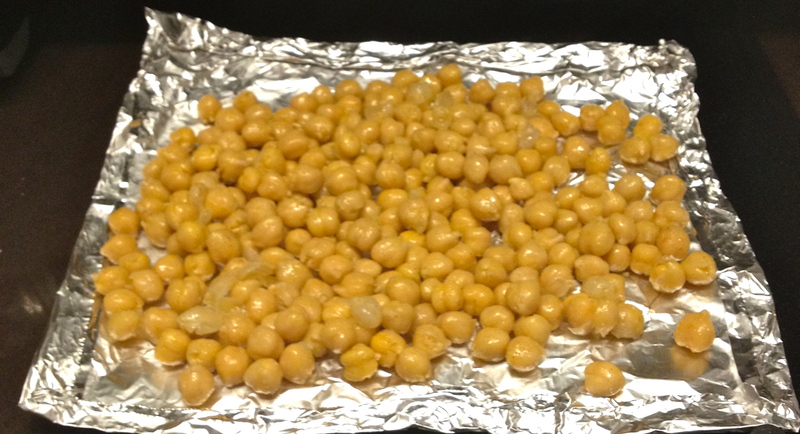 Lay chickpeas on baking sheet in a single, flat layer. 5. Place baking sheet in oven and bake for approximately 40 minutes, or until desired crunchiness. Mix every 15 minutes. Serve warm. *note: the sodium content of this dish is based on using no salt added beans. By rinsing and draining the beans, you will remove most of the salt if your beans are canned with salt. You can also choose to make your own chickpeas from dried beans with no added salt. This warm salad will make you feel like you’re eating comfort food in these dropping temperatures! This dish, which can be a snack, a side dish, or a perfectly adequate meal if you add some protein, makes use of some of fall’s best treasures. Butternut squash is a winter squash that supplies a ton of beta-carotene (A precursor form of vitamin A), along with vitamin C, vitamin K, potassium and fiber. Also, kale is a nutritionally power-packed leafy green that offers up even more vitamin C, vitamin A and vitamin K, along with iron, calcium and a ton of other vitamins and minerals. The acidity from the lemon juice helps to break down the nutrients in kale in order to increase bioavailability, and also helps to counteract the bitter taste of this green. 2.Place cubed squash on baking sheet and drizzle 1 Tbsp olive oil over squash. Add dash salt and dash ground black pepper. 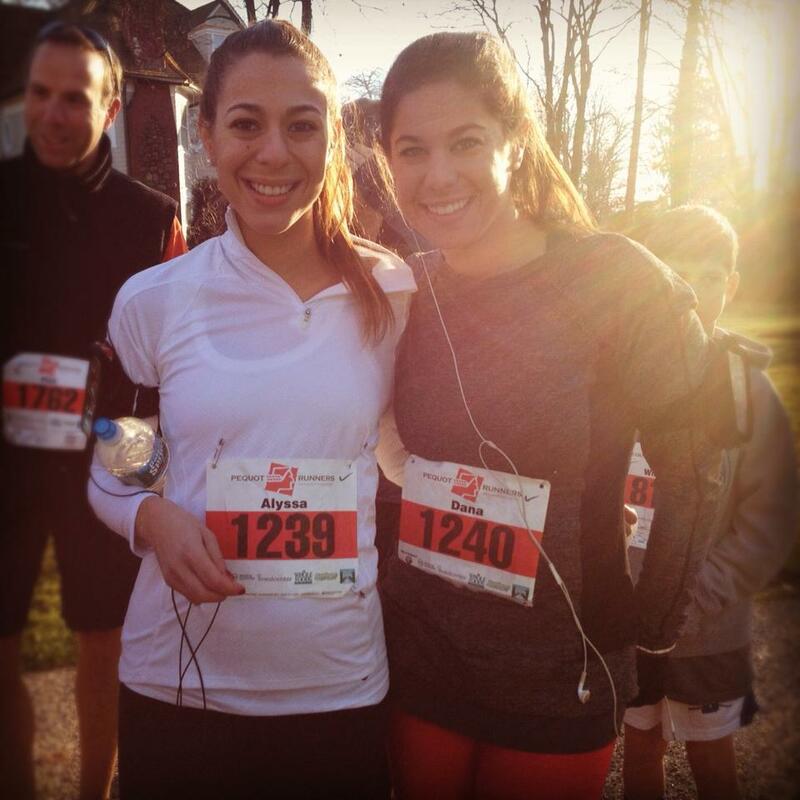 Bake in oven once preheated approximately 45 minutes, mixing every 15-20 minutes. 3. Chop kale and remove large stems. 4. Add remaining 1 Tbsp olive oil to skillet and warm over medium heat. 5. 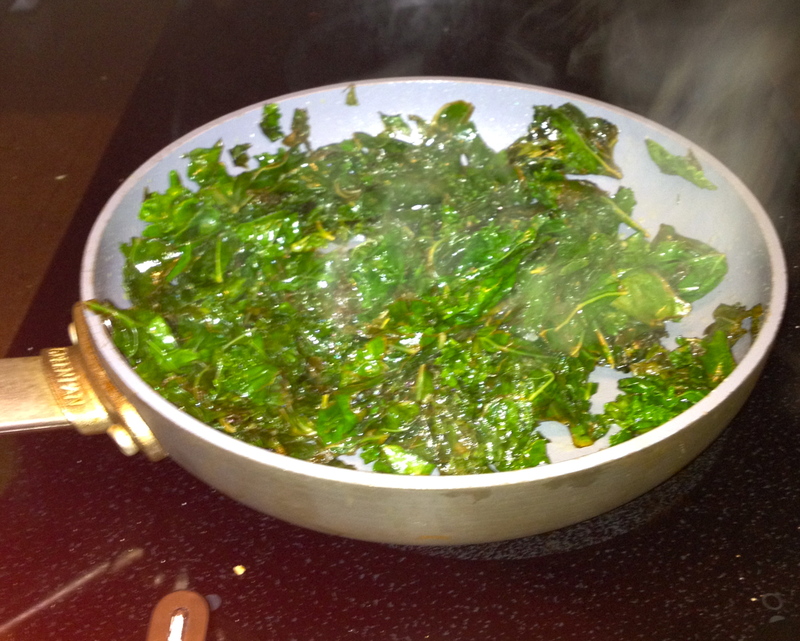 Add kale to skillet. Cook approximately 5 minutes, stirring often. 6. Squeeze juice from 1/2 lemon over kale and mix well. Add remaining black pepper to kale. Allow to cook another 5 minutes, stirring often. 7. 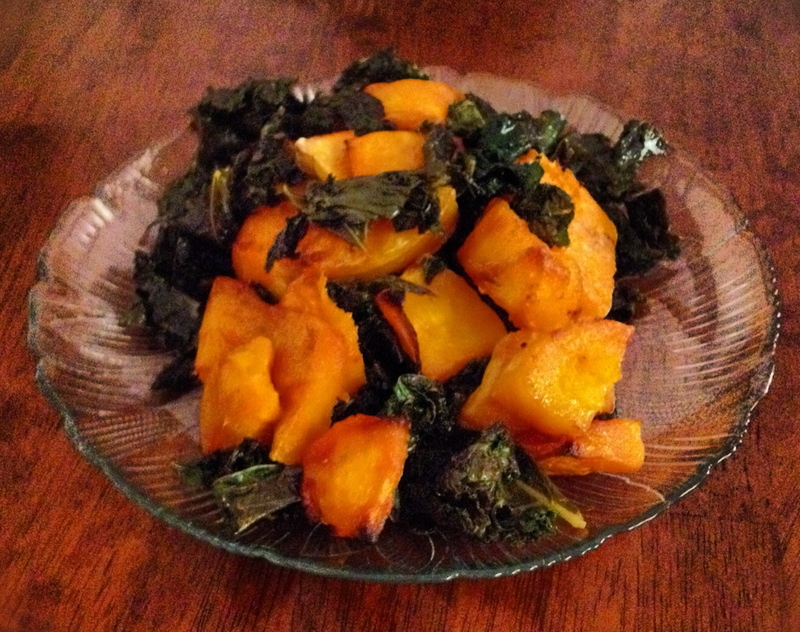 Combine kale and squash and mix. Serve warm. Craving pasta? Have no fear! 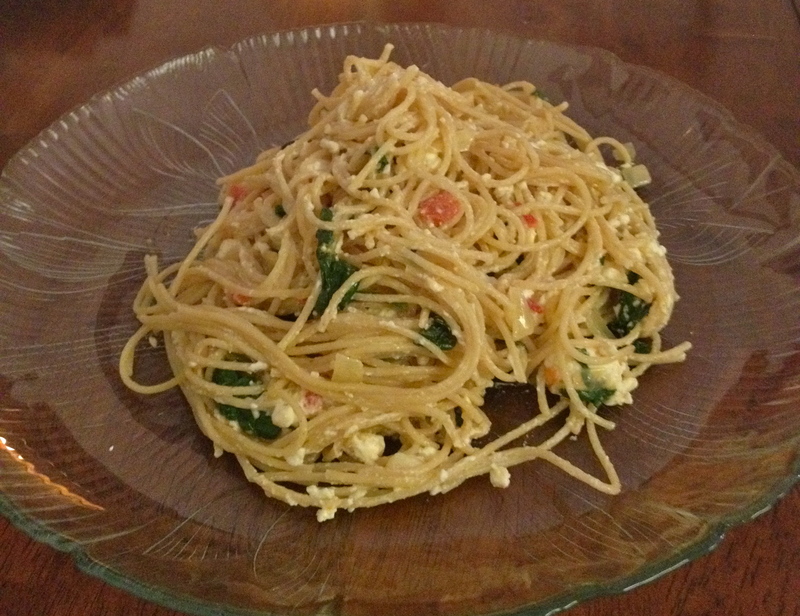 This pasta dish will fill you up without weighing you down! The whole wheat pasta offers fiber and nutrients that aren’t naturally present in refined, white pasta. This will help to pump up the nutrition of this dish and may keep you fuller, longer. Also, this pasta dish isn’t loaded with fat – instead, it contains a ton of veggies, with a modest amount of healthy fat (mostly monounsaturated fat from the olive oil). 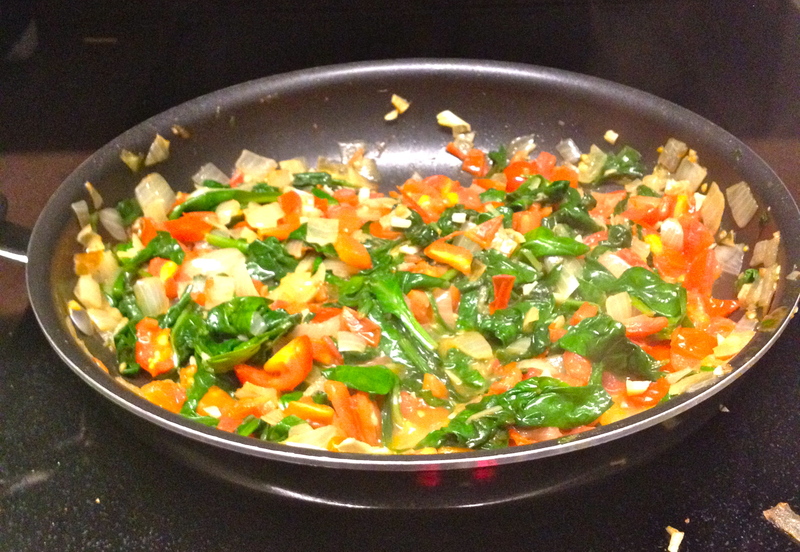 The fat aids in the absorption of vitamins A and K, both present in this dish from hefty amounts of tomatoes and spinach! The best part about this dish? It can be ready in about 25 minutes! Easy dinners just got a whole lot healthier! 1. Boil water in large pot for pasta. 2. While pasta is boiling, chop onion, and tomatoes and mince garlic. Tomatoes should be cut into quarters. 3. Pour 2 Tbsp olive oil in medium skillet and heat over medium heat. 4. Place onion in skillet and heat approximately 5-7 minutes, until soft and translucent. Stir occasionally. 5. Add garlic to skillet. Continue cooking 2-3 minutes, stirring occasionally. 6. If the water is boiling at this point (it most likely will be) then add pasta. If you’d like, break pasta in half before adding to water. Stir pasta occasionally. 7. Add tomatoes to skillet. Continue cooking 5-7 minutes, stirring occasionally. Add spinach and black pepper. Allow spinach to wilt (about 2-3 minutes). 8. When pasta is done cooking (approximately 7-9 minutes), drain. Place remaining 6 Tbsp olive oil in pot and lower to low-medium heat. 9. 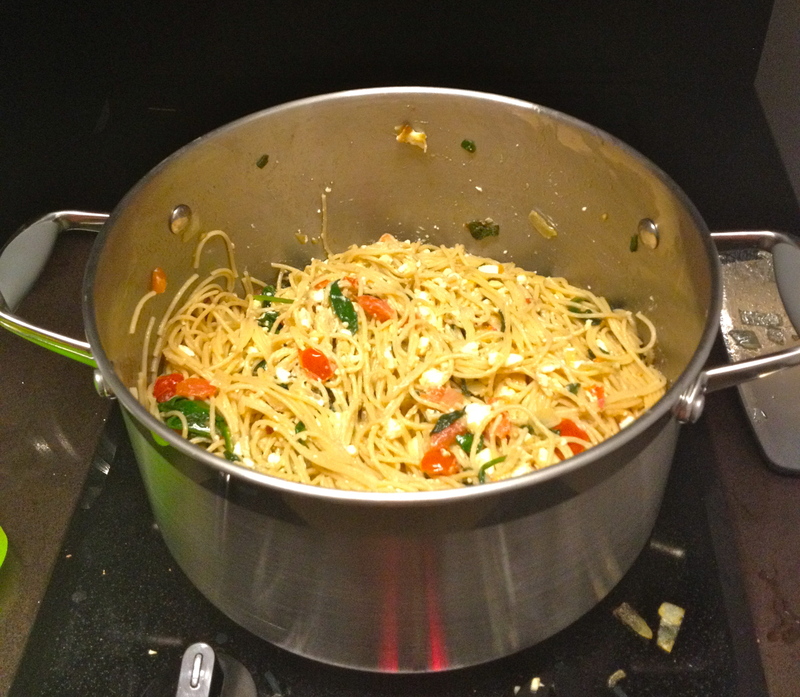 Add pasta to large pot with olive oil and mix ingredients. Add veggie mixture from skillet to pasta and stir. 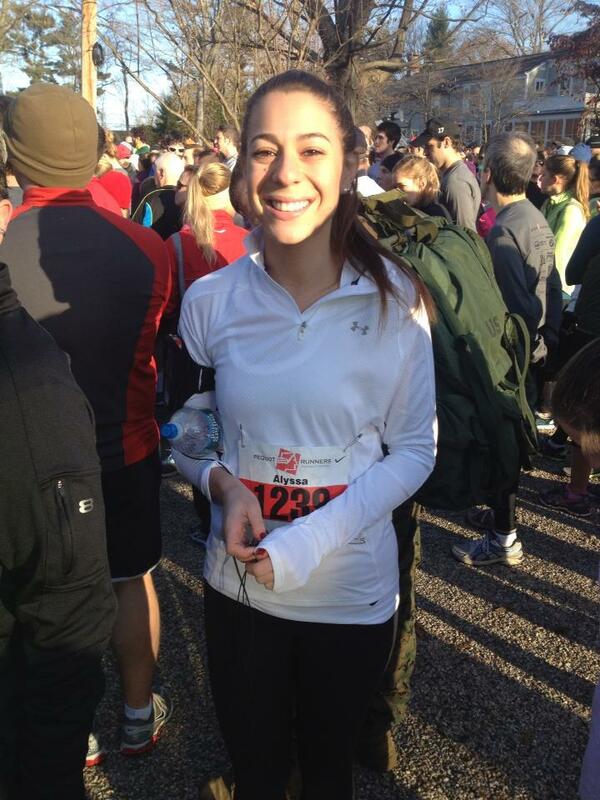 Heat approximately 2 minutes. 10. Add feta cheese and stir. 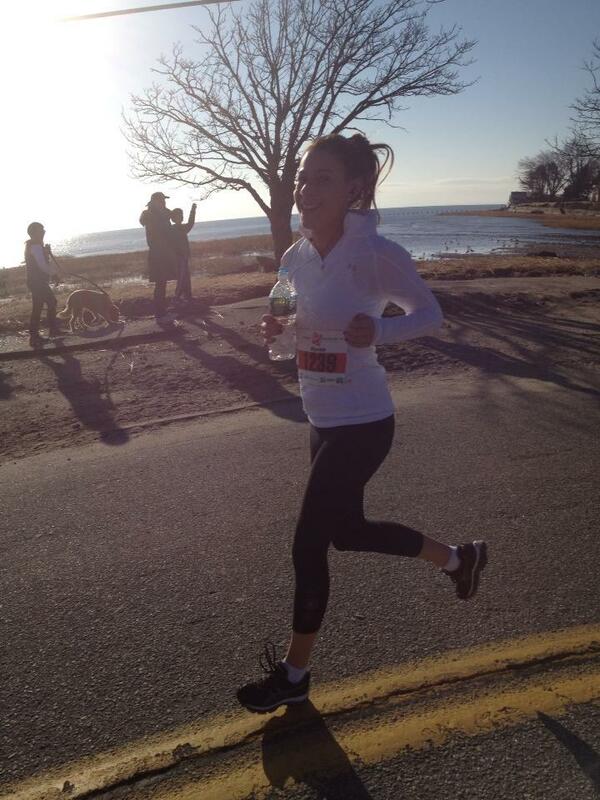 Heat approximately 2 minutes. Divide into 6 portions and serve.